Sometimes I struggle a bit with certain aspects of construction, but in this case I wasn't even certain of what I was attempting to construct. Most of the problems trend around a certain frantic waste of pace and failure to pay attention to detail. 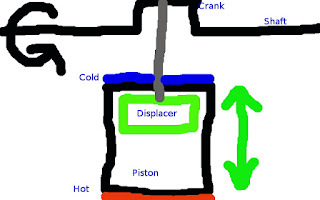 A Stirling engines basic list of components include a cylinder, a displacer, and a crankshaft. They also include a hot bit, and a cold bit. It's the difference between the hot bit and the cold bit that makes a Stirling engine an engine. There's also another really important bit, called the power piston. The power piston is connected to the same crank shaft, but on another crank. This crank is offset from the displacer's crank by 90 degrees. I'm not really sure how it does what it does, but this is my first attempt at making a Stirling engine. The power piston is the bit that's missing, because I didn't get that far. Some of the other missing bits include the rest of the components that make up a Stirling engine. 120 Things in 20 years - On a scale of one to ten, where one is a total fail, and ten is a total success, I wouldn't bother rating my first attempt at making a Stirling engine. Good animations and explanations of how many engines work, Stirling engines are at the bottom of the page.